People have many reasons for their interest in the martial arts. Besides the obvious concerns about personal safety and self-defence, some are drawn to the physical fitness and weight-loss aspects of training. Others seek to add discipline and self control to their lives. While others like the camaradie of the classes and meeting with like minded people. Over time these reasons will change for each individual as well. Whether your reason for wanting to learn martial arts, the Upper Hutt Hapkido Academy offers a number of programs that will fit your and/or your family's needs and your busy schedule as well. Our academy culture is relaxed and friendly. But we expect our students to train hard and push themselves to achieve their own goals and to realise their martial arts potential. We have a strong team of experienced Instructors - details of them can be found on our Instructors sub-page on the About Hapkido page. You will find that we offer much more than just martial arts and self-defence training and we would like you to join our team. So come along and try out an Orientation Class for you or your children and begin your own martial arts journey. All of our classes are run at our modern, owner-occupied martial arts studio in the centre of Upper Hutt. Further information Here. We are also the Headquarters School for the New Zealand Hapkido Federation which has member clubs throughout New Zealand. We are also an active member club of the World Kido Federation/Hanminjok Hapkido Association. The World Kido Federation is one of the most renowned and respected Korean self defence Martial Arts organisations in the world and the Hanminjok Hapkido Association is the largest international Hapkido organisation in the world with over 600 member clubs in South Korea and about another 400 spread throughout the world. Academy members are eligible to take part in the bienniel Korea Trip and Hapkido World Championships held in South Korea as well as attending other events and seminars held around the world including the Members Summit which is held in San Francisco in alternating years to the Korea Trip. At the Upper Hutt Hapkido Academy we offer martial arts classes for all ages, fitnss and skill levels. Our goal is to provide you with the highest quality of martial arts instruction so that you receive the greatest value for your time and effort. Our core classes are our Hapkido classes which will not only help you become proficient in self-defence but will also increase your physical abilities - stamina, strength, and flexibility - as well as your mental awareness and confidence. Martial arts training can also help you manage stress which can be so prevalent in the daily lives of teens and adults. The Upper Hutt Hapkido Academy's Tigers program is more than kicking, punching, and self-defense. Your child will learn important life and leadership skills, how to focus on maximum achievement, and build the unshakable confidence and self-discipline required to reach their full potential. They will learn how to set goals and acquire the perseverance to achieve them because we have crafted a sophisticated reward system that systematically encourages and motivates children to aspire to excellence. The Little Dragons program is designed specifically for children aged from 4 to 6. It is a non-competitive environment with the focus being fun, fitness, and martial arts fundamentals. In the Little Dragon’s program, your child will build self-discipline, physical awareness and of course basic martial arts skills, and bully-proofing techniques. All classes are taught using the safest, fun, and exciting instruction methods available for this age group. Ground Combatives covers ground fighting and applying Hapkido techniques while on the ground. While our core Hapkido syllabus does include some ground self defence techniqes, Ground Combatives takes this aspect of Hapkido to a much deeper level. Based on Brazilian Ju-Jitsu, Ground Combatives is a martial art in its own right that you can earn a black belt in. You need to be a teenage or adult student enrolled in our Hapkido classes and at least a Blue Belt to attend this class. Kyusho-Jitsu ("One Second Fighting") covers attacking anatomical weak points in a structured and scientific manner. While our core Hapkido syllabus does cover this to some extent, Kyusho-Jitsu takes this aspect of Hapkido to a much deeper level and is a martial art in its own right that you can also earn a black belt in. You need to be a teenage or adult student enrolled in our Hapkido classes and at least a Blue Belt to attend this class. Sword Fighting skills for both children and adults is also offered as a stand-alone class or to compliment your Hapkido training. Further Information Here. 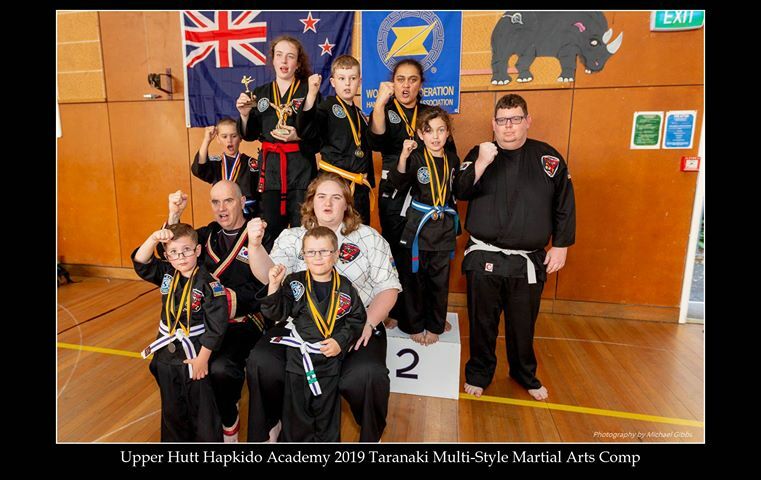 The Upper Hutt Hapkido Academy sent a team to take part in the 2019 New Plymouth Multi-Style Tournament hosted by the New Plymouth Taekwondo and Hapkido Club. Despite having one of the smallest teams there, we performed strongly. We are not a tournament focused Academy but we realise that a portion of our members want to take part in such events and we encourage them to do so. Because we have a group of students who want to pursue more such opportunities to test themselves, we will be putting together an Academn Tournament and Display Team soon along with a weekly training class for them. 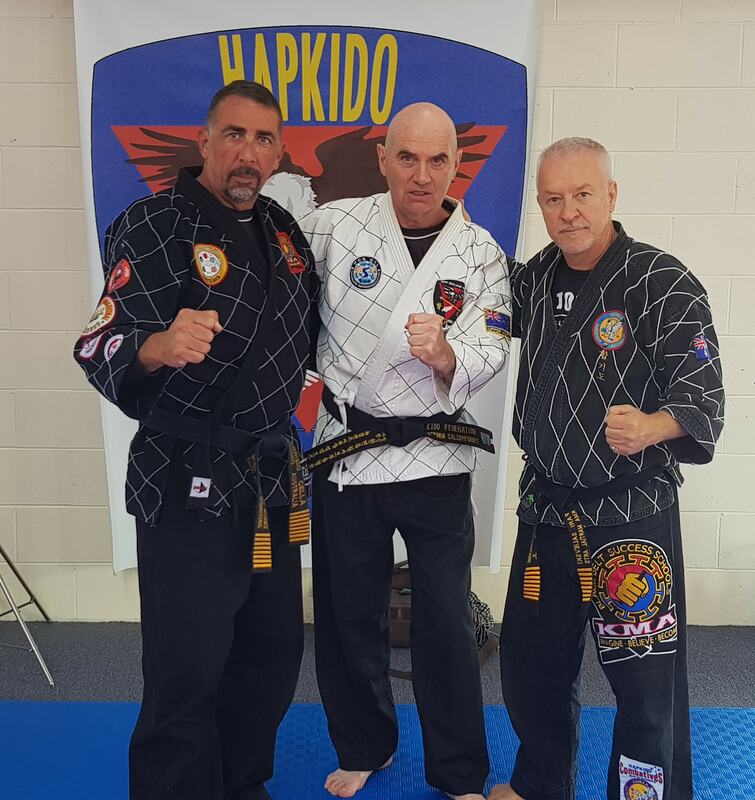 In order for students to learn more about a couple of key aspects of Hapkido, we have started a new "Ground Combatives" class and a new "Pressure Point" (Kyusho-Jitsu) class to add to our class offerings at the Upper Hutt Hapkido Academy. We don't have time in the Hapkido classes to explore either these in great detail. The two new classes will allow students who have more of an interest in these topics to study them further. Both are separate arts in their own right so have their own grading systems. Grand Masters Fari Salievski and Fab Cella from Sydney will be assisting our Head Instructor Callum Forbes with the development of these new classes.